Ginkgo Organic Gardens was founded in 1994 by Sarah Steedman and Jill Swan as a way to provide organic food to food banks in Uptown. With the help of the City of Chicago, Jill and Sarah converted an empty double lot into a garden with fencing, raised beds, a tool shed, and fruit trees. In 1998, Ginkgo joined the NeighborSpace network of Chicago community gardens. Ginkgo initially donated the produce from its garden to a variety of service organizations, but eventually established a relationship with the Northside location of Vital Bridges, a multi-service center that helps people with HIV/AIDS in metropolitan Chicago. 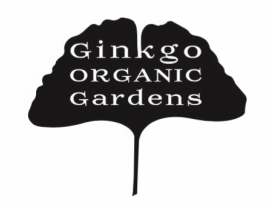 In 2003, Ginkgo became a partner organization of Chicago Cares, providing an option for volunteers wanting to combine interests in gardening and community service. Chicago Cares recognized Ginkgo as a Community Partner Star in 2011.